I just put white flat into my SR95S UT, Vf measured 3.28v, a little bit above my target 3.25v. Compared to my BLF GT at 30 meter just now, it is 725kcd vs 938kcd, about 835 otf lumens. It is not easy to get it focus precisely, and i didn’t aim for perfect focus to save myself from OCD cycles. It is quite white not as blue as picture shown below. So I will repost again Mine redneck test of Osram White Flat 2mm. Fully charged Samsung INR 30 Q. Single cell 18650 light with FET Djozz driver. around 5-10 seconds on lux meter. 4.0V, 12.5A, 950 FC 950FC same performance as XP-G2 S4 2B DD driven at 4.7A. Maybe still my reflows are worse than yours so that I can not get better performance past 6A and I have to practice on that. Just put INR 30Q inside for testing purposes. At really high powers I get worse performance than others on my led tests too, and I’m thinking that one possible reason is a slightly thicker solder layer than others. I use no solder stencil, and when after melting of the solder I push on the led a slight bit of solder (by no means thick blobs) can be squeezed out so I do not use the absolute minimum. I don’t know what to say? I always used a little bit more solder paste on XP-G2 S4 2B put I pushed excess off so it got those solder blobs on the side like in pics… Performance of last XP-G2 series of emitters I got from Hank is very consistent too. But since XP-G2 gets naturally sucked in it is really no problem to push excess solder off. 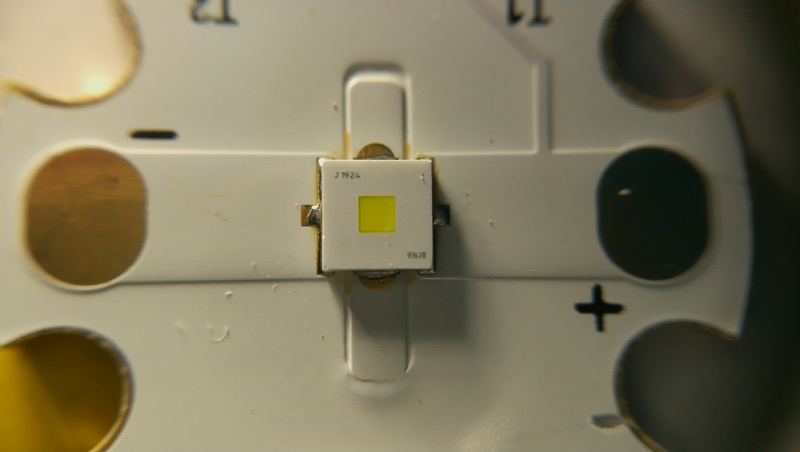 About reflow… I do slightly modified Old Lumens method. Hakko 936, Largest round flat Hakko tip, and 320 celzius temperature on soldering iron. 5-10 second and it is done. For white flat I really use thin application. When it reflows I gently move White Flat with toothpick (spreading solder, and centering). I use slightly more solder on the center pad but nothing excessive IMO. ^^^^ Measure it from at least 15-20m. the reflector/led size ratio is huge so need big distance for measurement. Thanks. Will do. Been waiting for clear atmospheric conditions. I just read your post about tuning to highest readings at longer distances. That makes alot of sense. Will have to try that. Did I told you that with L4P boards I have greater gain with FET driver than with Noctigon or Maxtoch board? I will give you true figures. You know that I use XPG2S42BDD exclusively so following are real figures I was getting before I got L4P board, and I will admit that after I received new L4P boards I contacted L4P and told him that his L4P board looks like crab when I compare it to Noctigon(you know thickness, gold plated etc. ), and that I am bit disappointed and then when I tested his L4P DTP I just felt ashamed cause it killed noc and maxtoch in performance. So here is one more reason why we may getting different results. L4P even explained why such differences among DTP may occur but I can’t find that post. You guys have way too many variables to get any useful information. A constant current buck regulated power supply is necessary for a proper comparison. Of course you are correct but I can’t really help the variables because I was not testing a led but making a flashlight. We will see how this led works out for other hosts and other people. I have not done my last mod with it for sure. You guys have way too many variables to get any useful information. A constant current buck regulated power supply is necessary for a proper comparison. Hmm… That will not be 100% reliable method. Why? And then there are more like reflowing time and temperature (shorter re flow time means better in my diy book cause emitter can loose properties if you are cooking it to long). And then when you mentioned buck regulated power supply. Is there budget or pro versions of this and possible differences between them which could influence on final test results? djozz, are you going to do an output test of the 2mm^2 white flat? I bought 4 from mouser and can do an estimated output vs current measurement, though luminarium’s numbers give a rough idea of where the peak is. I will also put it in an EE X6 head and measure the throw while powered by a constant current supply. For me the real advantage is the very low Vf. I plan to put 4 of these in my C8 quad. A single cell will drive them pretty nicely I think. Exactly, making a flashlight is completely different from trying to make accurate and repeatable scientific tests. Totally possible that in your scenario some other LED performs better in that case. D1S or Jaxman Z1 for this led ? I think Vinh announce his newest mod and pick 3.4v for 1mm2 and 3.3v for 2mm2, your graph match that perfectly. EDIT looks like Vinh might have got the numbers from led4power because they are totally same. You said and the graph says KW CSLNM1.TG but that has perfect squaare die. But on the led image it is not square. Is something mixed up? His graph has both the CSLNM1.TG and the CSLPM1.TG. One is square die and the other is not. The most recent test he is talking about right now is the CSLPM1.TG which has a rectangular die. It is too early morning for me! Need a coffee! That’s a somewhat dissapointing result in terms of brightness! The low Vf is great. It might just be that you tested a low performing sample. The Q8WP that koef3 tested a while ago got up to 9.6A (although his cooling setup might be slightly better). The Q8WP that koef3 tested a while ago got up to 9.6A (although his cooling steup mightbe slightly better). Yes, I get consistent lower thermal performance than other led-testers, if it is the reflow and/or the amount of cooling from my copper mount I do not exactly know. 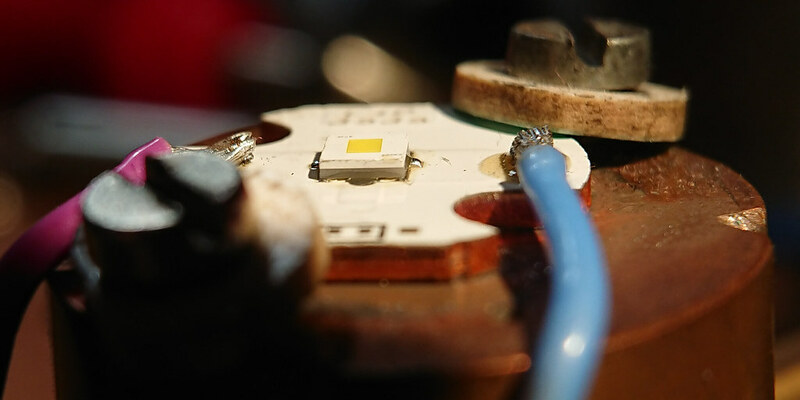 I could order a mounted led from l4p (he uses a different solder) and see if that tests different but I was planning a sort of half test-retirement anyway in which I mainly test for my own builds (and post the test for others to get at least an impression), and the results that I get are certainly relevant for myself. Djozz after seeing your cooling setup I think that that is your problem. You have too much copper between the LED and the fins. Copper is a great heatsink and can store a good amount of heat but it’s not as fast in conducting it. I think the temperature is getting too high as it can’t get rid of it quickly enough. It might be better if you just took a modern cpu cooler (something like the last generations from and or Intel) and mount the led directly on it. Thanks for the test! That's a somewhat dissapointing result in terms of brightness! The low Vf is great. It might just be that you tested a low performing sample. The "Q8WP ":http://budgetlightforum.com/node/58848 that koef3 tested a while ago got up to 9.6A (although his cooling steup mightbe slightly better). Q8WP and PM1 basically use same chip, so why you would expect some drastic increase in performance? Q8WP is in bigger package which could explain a little bit higher max. current, but you can also see that lumen output barely rises over 8Amps, which means chip itself is close to its limit at 8+Amps anyway. 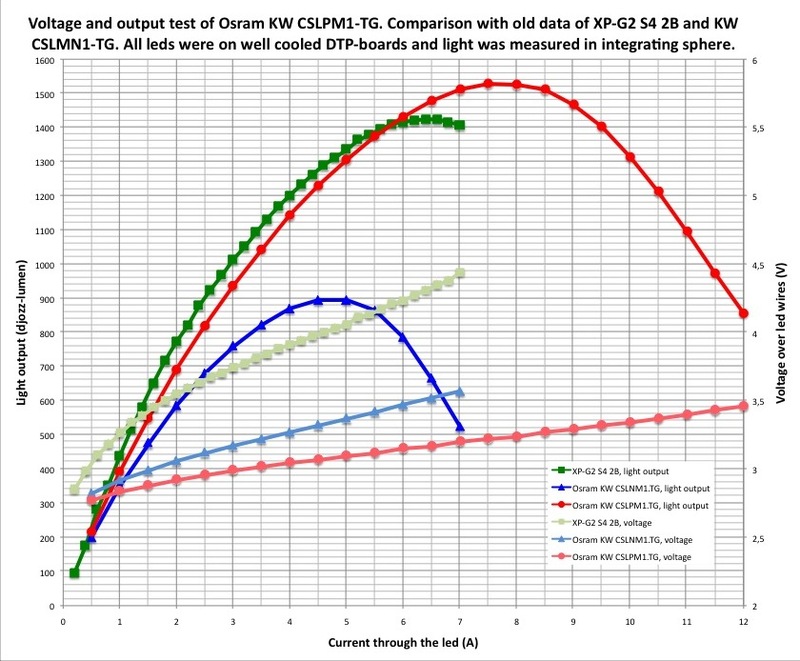 Also,Q8WP has some side emitted lumens, PM1 emits light only from front side, which should make it better for cd/mm2 performance, even for same lm output vs Q8WP. You basically have best 2mm2 throw LED which is brighter than any other 2mm2 LED,has lower Vf than any other LED (per mm2), it's factory dedomed,has nice neutral (non-green) tint and you are disappointed? Q8WP had the same peak intensity as HWQP. 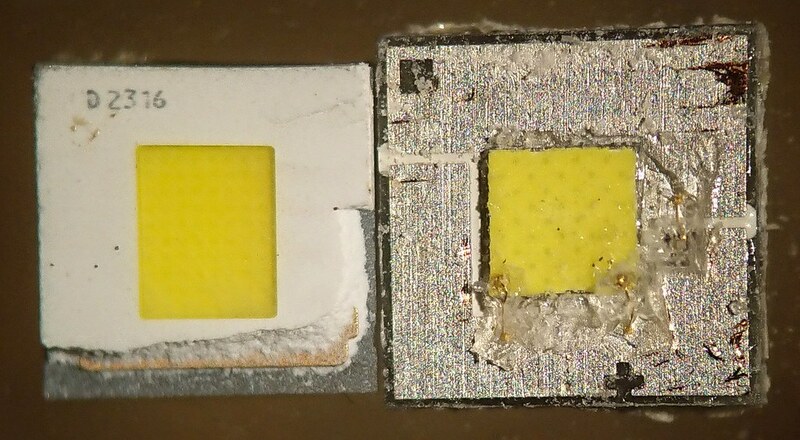 Same generation, same performance in a nearly 2 times larger die. NM1 is a significant improvement over HWQP, better intensity, lower Vf. I expected PM1 to be improvement over Q8WP as well. I didn’t expect it to have the same intensity as NM1 because it has the same thermal pad size with double die size, but nevertheless I expected that Q8WP would be beaten. Now it doesn’t seem so, though we lack data to know for sure. Due to symmetric package as well as common footprint it is easier to use, but that’s just that. Well, it is also easier to get. I think that PM1 is an awesome LED and I would find many uses for it, but nevertheless I expected more from it. Djozz after seeing your cooling setup I think that that is your problem. You have too much copper between the LED and the fins. 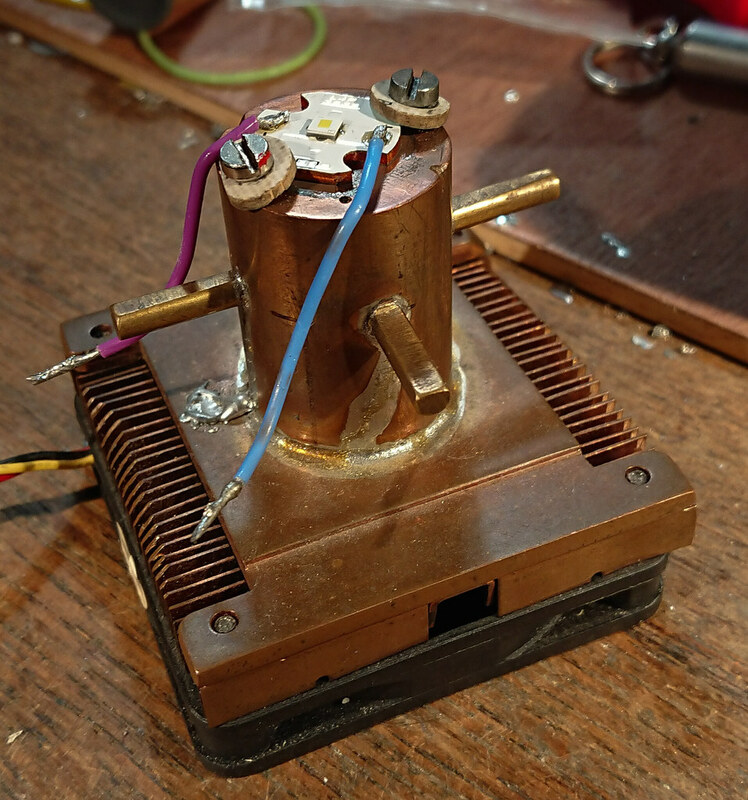 Copper is a great heatsink and can store a good amount of heat but it's not as fast in conducting it. I think the temperature is getting too high as it can't get rid of it quickly enough. It might be better if you just took a modern cpu cooler (something like the last generations from and or Intel) and mount the led directly on it. This could definitely be a reason for lower peaks, I don't know dimensions of that piece of copper rod, but I took 25mm diameter and 35mm length, and result is about 0.2C/W of additional thermal resistance, this could be enough to cause lower peak currents and lower lumens, but not by much for smaller LEDs,depends a lot on LED C/W itself,and total power. I sometimes directly after a test feel the ledmount with my hand and it was never hotter than luke-warm, even when testing the XHP70.2 led. So if keeping the mount under the ledboard right at 20 degC or 40degC explains a much lower thermal performance then yes, my long mount is to blame for lower performance. In that case most flashlight builds will suffer from the same problem. Btw, among metals copper is about the fastest thermal conductor on the planet/universe. The copper rod is 30mm diameter and about 60mm long (not at home so I can’t exactly measure). I need it to lower the led inside the sphere while still keeping access to the ledwires. I could save half the length of the copper bar by using 4 times longer ledwires and guide them through the heatsink to the side of the fan. Longer ledwires would influence the measured voltage at higher currents somewhat, or for each led-test I should solder separate wires on the board for voltage measurements. But my life does not depend on these tests, nor are my flashlight builds different if they were that bit more accurate. so I just may leave my set-up as it is and hope for Koef3 or maukka to test these leds too and go the extra mile in accuracy. It might sound surprising but as soon as you remove/turn off heat source(LED in this case), temperature of that copper piece drop very fast(if bottom cooler still works). So you can't "feel" by finger how hot is top of copper rod when LED is working. It's like you are trying to measure capacitor voltage after you charge it and disconnect from power supply; copper rod is thermal capacitor itself,but it also is resistor in parallel with that capacitor because it's very thermally conductive. So you have parallel RC circuit. So when you connect this network to power supply(=heat source analogy), it will charge to for ex. 5V (volts = temp difference analogy) and stay there as long as it's connected to power supply. But as soon as you remove power supply(=heat source analogy), voltage (=temp. difference analogy) drops rapidly due to low value of parallel resistor (electrical resistance=thermal resistance analogy). That's why you never feel that top of copper rod is hot.